Spring is coming to Cordova, Alaska, along with a visit from Hollywood. A movie company is shooting the action sequences for an adventure film called North To Fortune. The film is a big-budget production with a well-known director and stars. Charlotte Brody is not particularly star-struck but she is looking forward to covering the story for the local paper. Not everyone is excited, however; the local native Eyak Indians do not feel that they will be accurately portrayed in the film. There is a lot of tension between the Eyaks and the film-makers, and among the cast and crew, culminating in the murder of the film's director out on the glacier. Some of the company even whisper that the film is cursed. The natives are the obvious suspects according to some, but what about the producer worried about cost overruns, the cheating director's wife, and his daughter who has a dangerous secret? 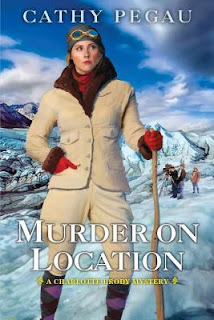 Charlotte Brody is an intrepid reporter and sleuth, often driving her doctor brother to distraction. Her love interest, Deputy James Eddington, also tries to keep her out of the case but soon realizes that she won't stop until she gets the story and the murderer. This time, Charlotte may have bitten off more than she can chew. Charlotte is a likable and thoroughly "modern" young woman who is learning to love her new life in the Alaska Territory of the 1920's. The books in this series offer a glimpse of what it may have been like to be among the last pioneers in America. Thanks to NetGalley and Kensington Books for an advance digital copy in return for an honest review.